Recently my father and my son purchased and installed a motorized bike kit on a standard 26 inch bicycle. I wondered why this wouldn’t be considered a motorcycle. I found out that a motorized bicycle generally has a motor smaller than 50cc, and it can be powered by pedals alone if necessary. A moped or small motorcycle does not have pedals and is not capable of propelling the bike alone without the gas or electric motor. The engine is designed to be pedal/chain started so you can start or stop the engine while riding. 1 Gallon of fuel will take you 80-100 miles! This bike will operate at up to 40 Miles per hour. To install a kit you will need some basic skills using tools and a few hours of your time. The most difficult part of installation seemed to be the sprocket. Follow the users manual for gas/oil mix and adjustments. Motorized bike kits come in a variety of price ranges and capabilities. When learning about motorized bike kits, I found that the electric bicycles and gas powered bicycles each have their own fan base with many pros and cons on each side of the debate. This bike will still turn out emissions into the environment being gas powered, however it is still enormously less of a footprint then operating a car to work or school everyday. Many people pedal-power these bikes and only utilize the engine when they get tired or are climbing a steep incline. In Asia and Europe, this has been a accepted mode of transportation for some time. Only now is it becoming a popular idea in America (most likely due to rising gasoline prices.) Motorized bicycles have utilized many types of engines, from internal-combustion, two-stroke and four–stroke gasoline engines; to electric, diesel, and even steam propulsion. I recommend this concept to anyone that would be keen on saving money on gas, reducing pollution, and takes pleasure in a good ride! 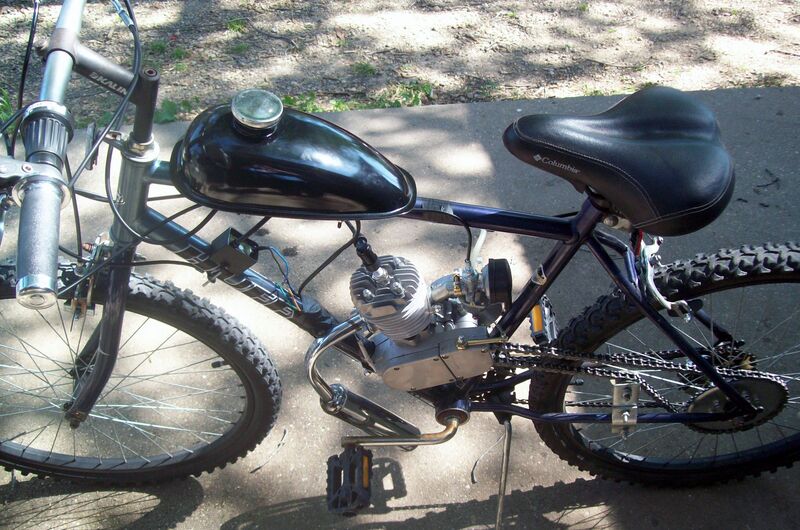 Posted by Createityourself on May 29, 2012 in Project Center, Saving Money, Uncategorized and tagged gas bike motor, gas powered bicycle, gas powered bike, gas prices, motorized bicycle, motorized bike, motorized bike kits, saving money, saving of fuel. A neat project to do with someone special! Yes, great project for teens. Thanks for commenting! Buddy of mine used to buy these kits and install them on the Old Schwinn bikes. Not much of a market for them around here and he quit. No not much of a market for sure…but my son is saving a little money and getting around pretty good on it. Thanks for commenting!